Lavishly speckled and streaked petals form large (up to 15cm across), highly scented flowers in midsummer. These look magnificent in the border and if cut will fill your home with their perfume. 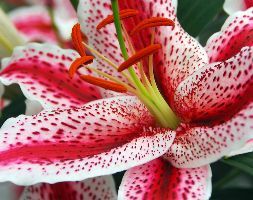 An elegant and eye-catching lily that performs well in the garden.